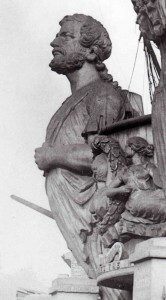 The Orion figurehead appeared on the central gate at Baltic Wharf in the late nineteenth and early twentieth century and presented an imposing figurehead, which would have been admired by the many passers by walking down Milbank towards the Houses of Parliament at Westminster. Sadly the figurehead has been lost, but the circumstances surrounding its demise remain a mystery and no information has been forthcoming about its possible location if it should still exist. The figurehead was known to be in the possession of The Royal United Service Museum in the Banqueting House, Whitehall. It is suspected that it fell into decay and was subsequently destroyed. HMS Orion was ordered as an 80 gun second rate on 30 March 1848 and launched on 6 November 1854. She took part in the Crimean War in 1855 serving in the Baltic Sea. For her service in the Baltic she was awarded the battle honour Baltic 1855. She was taken out of service in 1861.